Have you tried wines from Singletree Winery? They are a local, Abbotsford, BC winery that produces wines from their own grapes in the Fraser Valley, but they now have another vineyard located on the Naramata Bench. This is also the time of the year that BC wineries release the latest vintages of their white wines. Below is a press release from Singletree Winery telling you about their latest wines and about their new Naramata Bench vineyard. Enjoy! The Etsell Family. Photo by BC Wine Institute. April is BC wine month and the 2018 Vintage Release is here! The winery team is so excited as they have added some new wines to the portfolio. Some of these wines will sell out very quickly, as past years have seen huge demand for the Rosé and Siggy and the family expects 2019 to be the same. Singletree Naramata Bench opened in 2018 as the sister winery to the original Abbotsford location. Singletree has been using grapes grown in Naramata for its red wines, so it was a natural progression to open the second location. 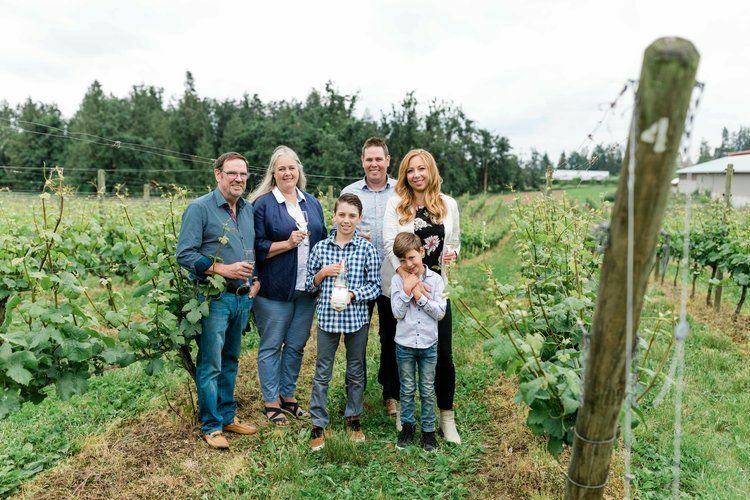 In January 2019, the Etsell family purchased a second piece of land in Naramata, a vineyard only, to further cement their red wine grape supply. The Naramata Bench is a special location possessing glacial soils and a warm climate, resulting in luscious red wines. Visitors are invited to the bright and welcoming tasting room so they may enjoy a snack and a glass on the patio overlooking the breathtaking view of the Okanagan Lake. The Singletree Naramata Bench tasting room is open in April and May from Wednesday to Sunday, 10:30 am – 5:30 pm. After the long weekend in May until Thanksgiving the winery is open 7 days a week, 10:30 am – 5:30 pm. All other times will be by appointment. As mentioned, the season kicks off on April 13 with the new release celebration from 12:00 pm – 5:30 pm. To celebrate Mother’s Day, a special offering of the new traditional method sparkling Chardonnay and Pinot Noir blend called Merryfield will be available, with additional fun activities. Singletree Winery Fraser Valley is in the Mt. Lehman area of Abbotsford since 2015, and Singletree Naramata Bench opened in 2018. The Etsell family has deep roots in the agricultural community. With careful attention to their land, they are committed to showcasing the best of British Columbia: the Fraser Valley, which provides a lineup of aromatic and juicy wines that highlight this unique terroir; and Naramata Bench in the Okanagan, known for producing amazing reds. Their portfolio includes Siegerrebe, Sauvignon Blanc, Pinot Gris, Viognier, Chardonnay, Grüner Veltliner, Late Harvest Kerner, Pinot Noir, Rosé, Wild Ferment Siegerrebe, Harness, a Bordeaux red blend, and a Frizzante Sparkling wine called Victory. The wines are made by second generation family member Andrew Etsell. The Fraser Valley winery is open for visitors Wednesday through Sunday, from 12:00 pm – 5:30 pm from September to May. From June to September, they are open 7 days a week with the same hours. Naramata is open in April and May from Wednesday to Sunday, 10:30 am – 5:30 pm. After the long weekend in May until Thanksgiving the winery is open 7 days a week, 10:30 am – 5:30 pm. All other times will be by appointment. Visit singletreewinery.com to join the wine club and for more information on picnics, events, weddings, and much more. Or, follow @singletreewine on Instagram and Facebook.